anointedheels: NewsLetter: Why should you sign up? NewsLetter: Why should you sign up? Hello ladies and possible gents! Let me start by saying how much I appreciate you taking the time to read listen to me, I love to interact with you guys, and stay connected as much as possible. It use to be fun connecting through social media and whatnot but nowadays social media have become a bit too noisy. It's like we're all yelling over each other trying to say something but no one is listening because it's too loud! Another thing is while Facebook use to be a good intimate way to stay in touch, it is not so anymore, Facebook hide my post to almost 90% of you guys, in an attempt to force me to pay for advertising so even though you've liked my page you'll most likely won't see my posts. 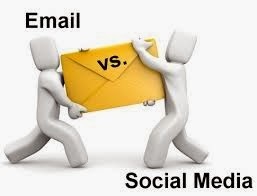 I believe it's time to go back to the old school email joint! You'll never miss and update, you get to read it at your own pace, save and archive what you like and the best part you would have chosen what you want to read not what Facebook said you can. I promise I will never spam you, you will only get what you sign up for, things pertaining to my blog and activities. You can unsubscribe at any time no obligations. Looking forward to connecting with you in a non- insane way!